An old woman pointed at the tiny fish, making a point of not smiling at all. The fishmonger picked up on the seriousness of the situation and stood up straight. Venetian women at the Rialto Market are not to be taken lightly and this particular one knew what she wanted. “Please give me a half a kilo of these,” she said, circling her finger around the circumference of fish on display. She looked at the man like my cat does when she tries to stare me down. The fishmonger quickly lost the staring contest. A little intimidated, he grabbed handfuls of the fish. A few escaped his gloved claws and fell back to the bed of ice. The woman watched him through her spectacles and then over them. Knowing he was still being observed, he added some flourish to his duties. He now leaned into his work and scooped faster. Satisfied that he was taking his job with seriousness and respect, the woman broke her stare. She then went about looking through her purse for her money. She was type of client that would provide exact change for the exact amount. She did just that without resorting to a smile of any kind. An efficient woman who probably shopped daily—she was on her way to another of her market stalls within minutes of the exchange. She walked with measured purpose to a vegetable stand, now turning her attention to some fine-looking radicchio tardivo. 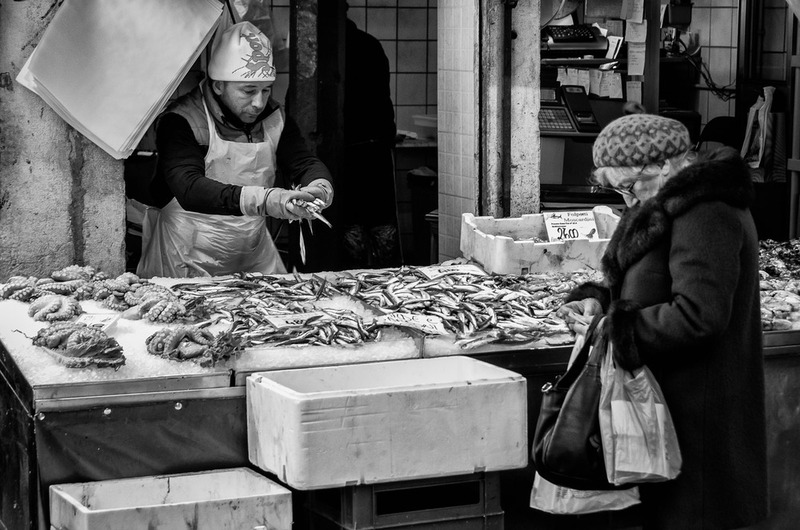 The fishmonger watched her as she went away, staring at her now that she was staring at someone else. Sighing, he rearranged his fish to heal over the gap caused by this most recent purchase. He then shrugged his shoulders and softly sang a song in Venetian dialect. His head rapidly turned from left to right and then left again, as if he were a seabird on a piling looking for prey. A woman in a full-length fur was coming his way so he straightened himself again. This time he looked down at his fish before she had a chance to give him her stare. Not fooled by his evasion she looked straight at him, folded her arms and asked for her fish. And so on went the fishmonger's day at a certain stall in the Rialto Market.